The idea of the foreign correspondent still holds a certain pull on the aspiring journalist’s imagination. If you’re of the literary persuasion, you’ll think of Graham Greene gallivanting among the exotica of south-east Asia, or of Ernest Hemingway filing his dispatches from Franco-ridden Spain, braving bullets and swigging Valdepeñas. Or else you think of crusaders like John Pilger, the Aussie who brought the horrors of the Pol Pot regime to the attention of people around the world. It’s the most adventurous, intrepid and romantic of journalism’s repertoire. 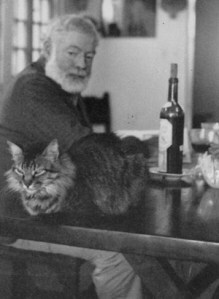 Hemingway and a small tiger. Budgets are tight nowadays and newspapers can ill-afford to maintain many international bureaux and send reporters across the globe as they used to. But some enterprising people decide to head off pretty much on a whim, going it alone. Deborah Bonello of MexicoReporter.com did it. Graham Holliday of Kigali Wire did it. And Kate Hodal, the Guardian’s south-east Asia correspondent did it. So perhaps freelance is the best way to do it. You get the freedom to explore what you want to explore. Write what you want to write and travel wherever you want to go. This blog will track a journey to be an in-demand freelance foreign correspondent. It will be a mixture of journalism tips and tricks, insights and news about the country I’m in and how you can make the most of it, as well as looking at the romance (both of life & love) of a foreign correspondent’s life. Because, let’s face it, that’s part of the fun.